START USING OFFICE RACK TODAY! TELL YOUR OFFICE MANAGER ABOUT US AND WE CAN HAVE YOU UP AND RUNNING WITHIN A FEW DAYS! Why go to the dry cleaners when the dry cleaners can come to you, everyday of the work week! 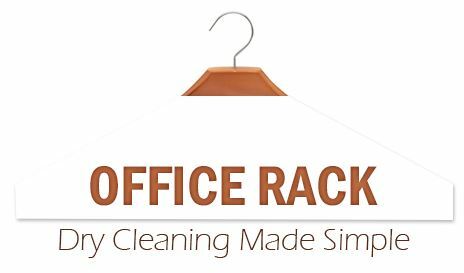 Our revolutionary new Office Rack service has been designed to enable businesses to offer their staff an in house dry cleaning service with no hassle and no headaches. NOTHING FOR YOU TO MANAGE! Special discount for members – the more Office Rack is used, the BIGGER the discounts! No need to collect money! To access simply sign up for free to Office Rack, and we do the rest. In return, Office Rack will provide your business with a free portable rack on which your team can hang their dirty clothes, as they await collection. Upon return all clean garments will be placed onto the rack. What’s more, every member of your team will receive an automatic special discount of 5-10% off their dry cleaning when they order via our website, only available to our Office Rack member businesses. We will also give you promotional material to get the whole team behind it! Place your online order, entering your unique code for your 5-10% discount. Pay online or COD. Place your garments beside your Office Rack. Your freshly cleaned garments are delivered back to you, placed onto your Office Rack for your collection. WANT TO SAVE TIME AND MONEY? GET STARTED TODAY!